To develop a watchmaking machining centre that is compact, precise, reliable and flexible enough to cope with small production runs. Iden-tifing the right numerical controller, kinematics and robots for the machine would be key to this. To build a machining centre based on a machine with 3 numerical axes and a low C axis on the spindle stock. 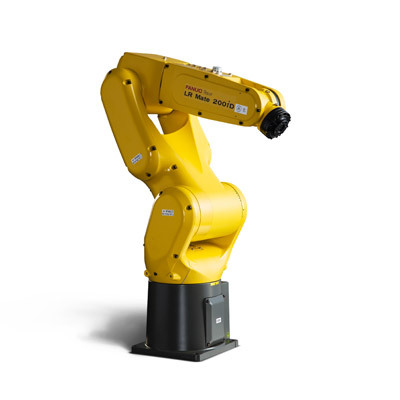 Source key components such as the numerical controller, inputs-outputs (I/O), drives, motors, encoders and the interface for linear axis measurements from FANUC. Equip the machining centre with a FANUC LR Mate 200iD/4S indus-trial robot. The watchmaking machining centre is bringing a new dynamism to the Swiss watchmaking industry. Designers, instrument makers and subcontractors now have Industry 4.0-capable manufacturing re-sources to match their global ambitions. Above all, a machine designed to manufacture watches must be precise and reliable. It may also have to be flexible to cope with small production runs. Numerical control, kinematics and robotisation play a key role in fulfilling these demands. For the new Emissa standard machine, these factors were decisive. Based in Le Locle (Neuchâtel), Emissa the manufacturer of custom and standard machines for automobile production and watchmaking performs 90% of the fabrication work on its components internally. Along with Pibomulti, a sister company that is a tool manufacturer, the most efficient machining technologies are applied to ensure the productivity, precision and flexibility required by the users of their machines. Since the death Pierre Boschi, the charismatic boss who united the two companies, Massimo Schiavi has been the commercial and technical director of this group employing 100 persons. "Our clients in the watchmaking industry are looking for increasing flexibility, often by means of automated machines. On the basis of our standard machines, we are able to produce customised production equipment with very short lead times," he explains. "The choice of numerical controller, kinematics and robots is therefore a key factor." In pursuit of this strategy, the Emissa design office developed the Atome machining centre. The centre is based on a machine with 3 numerical axes and a low C axis on the spindle stock. This elegant array means that workpieces can be chuck-, clamp- or flange-mounted. A tool magazine served by two gripper arms and with various options allows the performance of all machining operations required for watchmaking and decorative finishing such as beading, capping or creating côtes de Genève etc. The FANUC numerical controller is a 0i-MF. The dual channel version of this new model introduced in 2015 can simultaneously run two independent synchronisable programs. Its touch screen and its FANUC Picture screen customisation tools have made it possible for Emissa to redefine the man-machine interface to perfectly match customer needs. Pictograms and graphics can be integrated, especially in operating mode, to optimise guidance for the setting technician. 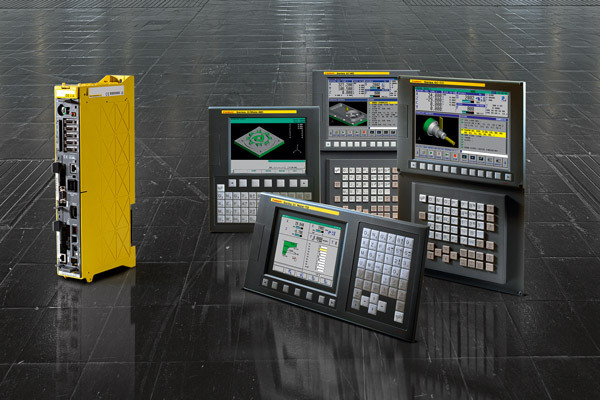 The FANUC MT-LINKi software integrates data/makes data available and graphically displays the status of the various networked machines. This perfect integration opens the way to implementation of Industry 4.0, the 4th industrial revolution. The FANUC motors are also state-of-the-art, packing as standard 4 million lines per revolution. Another asset for optimum control of axes that are typically linearly or circularly interpolated. "This is a key factor in achieving perfect surface finishes, especially in contouring," emphasises Tom Grillot, FANUC sales engineer. To increase the flexibility and autonomy of the Atome watchmaking machining centre yet further, a robot can be installed at one side of this very compact machine. Here too, the manufacturer opted for a FANUC robot, of the type LR Mate 200iD/4S. With two controlled axes and a 4 kg wrist load capacity, its positioning repeatability is +/- 0.02mm. It can also be programmed by FANUC ROBOGUIDE simulation software, thus adapting quickly and easily to the changes in production series. Arrayed at the robot base, the trayed blanks are mounted on the mandrel and then removed at the end of operation. Resetting for a new series is very quick, depending on the configurations of workpieces. "Our clients in the watchmaking industry are looking for increasing flexibility, often by means of automated machines. On the basis of our standard machines, we are able to produce customised production equipment with very short lead times. The choice of numerical controller, kinematics and robots is therefore a key factor." Emissa's CTO is happy with the decision to work with FANUC as a strategic partner: "With a mean time between failures (MTBF) of more than 50 years, with the 0i CNC, the reliability of all FANUC machines is incomparable," he says. "What is more, FANUC operates worldwide and can monitor our machines wherever they are installed," he adds. With 3.3 million digital controllers installed worldwide, FANUC is a clear market leader. The availability of spare parts is guaranteed for 25 years on all FANUC products. In the vast majority of cases, such as with the Atome machine, FANUC provides a complete package including the inputs-outputs (I/O), drives, motors, encoders and the interface for linear axis measurements. Accordingly, all the requirements of the machine's manufacturer and of the end user are met from a single source. "With FANUC, Swiss manufacturers, which are big exporters of machine tools, know that they can monitor their products worldwide," comments Tom Grillot. Finally, with its huge range of products such as CNC controllers, other control systems, motors, robotics, FANUC meets all conceivable requirements. All this makes the FANUC Group into a world leader in the automation of the networked production facilities. The partnership between Elissa and FANUC is bringing a new dynamism to the Swiss watchmaking industry. Designers, instrument makers, subcontractors, who are big players in the watchmaking industry now have manufacturing resources to match their global ambitions. Not only can they maintain their worldwide reputation for reliability and quality, they can now manufacture with manufacturing resources compatible with Industry 4.0. This dynamism will offers a way out of current and future economic and structural problems.